Alright, here is the official HungryZ guide to the taste. Print this up and take it along with you as you explore this years festivities. As you know I sampled 41 vendors this year. To make the guide a little more complete, I included my reviews from last year for some of the places I missed (noted) and thus bringing the total to 48. Enjoy! Abbey Pub–Piece of cod fish: The fish was very tender, flaky and fresh. Plus, it had excellent batter with a crunchy coating. It was delicious! Aunt Diana’s– Chocolate frozen banana:I liked that I could see steam coming off of it because it was so frozen. I was close to heaven just looking at it. It has nice milk chocolate and a thick frozen banana. Definitely hits the spot on a hot day. Thumbs up! Billy Goat Inn– 1/2 Cheeseburger: The buns are nice and fluffly and I’m a big fan of the doubles and triples. Of course, ya gotta love the Billy Goat, so you gotta love the ‘cheeseboigas’. B.J.’s Market– Mustard Fried Catfish: This portion has a great bread crumb coating with sweet mustard sauce on top. The fish is nice and flaky. A definite winner! Bolat African Cuisine– Grilled plantain with spicy peanut sauce: The plantain was nice, crisp and sweet. The sauce was a spicy peanut butter, but very smooth — unlike a normal thai sauce not like thai. Overall, it’s a little different but worth a thumbs up! Bucino’s– Stuffed sausage pizza: It had a nice sturdy and flaky crust, however the sausage seemed to be hiding a bit. There was loads of cheese that was melted well. Thumbs up. Buona– Canoli: Very creamy center with chocolate chips running throughout. It has a nice crisp outer shell. It could have used some pistachios, but overall a thumbs up. C’est Si Bon!– Meatballs. It’s very spicy. You can definitely taste the cayenne pepper, but I was disappointed with the texture. It tasted too over-processed. Thumbs down. Canady Le Chocolatier– Rasberry and Blueberry Sorbet: This hits the spot, it’s the perfect treat on a hot day like this. This is definitely a must stop on the ‘Taste’ trail. However, if fruit sorbet isn’t your thing, you can sample any gelato flavor at this stand! Celebration Creamery– Cup Of Vanilla Ice Cream: It has a rich and creamy flavor. Delicious. Not much else you can say for vanilla ice cream, but in 90+ degree weather- it’s heaven sent. Thumbs up! Chicago Chocolate Company– Turtle: Sweet caramel filling compliments nicely with a slight salty pecan. Very rich and creamy milk chocolate. A definite winner! Chicago Joe’s– Chili: The chili con carne is very good. It’s very rich and meaty. However, it’s so hot out today I wish I wasn’t eating chili. This is a thumbs up and definitely worth trying. Dominicks– 1/2 Watermelon: Really nice. The melon is about 3 inches thick and there is nothing better on a hot summer day. It was dripping on me, but you should take the plunge and try some, but move on to eat more. Eli’s Cheesecake– Plain Cheesecake: It’s excellent with a good cheese flavor. The cake is dense with a nice browned top. It’s a must try at the Taste. Father & Son– Cheese Pizza: When you get this one, check out the bottom of the crust. It’s golden brown with butter! The sauce is slightly spicy but not sweet. A definite thumbs up! Grazie!– 1/2 BBQ buffalo burger: I had to add extra sauce, but it was still a little dry, gamey and overcooked. Too chewy for my tastes. I’m not a fan of this one. Grill on the Alley– Gazpacho with avocado and chopped chives: Very refreshing. There is a lot of tomatoes, but not a lot of onions. There’s a good crunch with a different texture. If you’re a fan of gazpacho, this is a winner on a hot day! Be adventurous and check it out. Guey Lon– Vegetable tempura: If my mother would have fed me vegatables that were fried, I would have eaten them more often. It was nicely battered and not too crispy. Plus, the little bit of sweet and sour sauce was a perfect touch. Harold’s Chicken– Chicken Wings: Best chicken in the city. They’re slightly salty with a fresh crunch. Overall, it’s nice, moist fresh chicken. Thumbs up! Hash Browns– Sweet potato hash browns: I really like this. It’s a little breakfast at lunch. A little different, a little change of pace, but definitely good. JR Dessert Bakery– Plain Cheesecake Square: Nice and dense. Very rich, but not quite as good as Eli’s because it’s missing the carmelization on top. Thumbs up. La Justicia- Enchilada: The enchiladas had a tough exterior. It was a tad bland, even salt and pepper would liven up this dish. This one’s not a winner-thumbs down. Lou Malnati’s– Chopped Salad: Crisp lettuce, bacon, and mushrooms are dressed beautifully in their sweet onion dressing. Thumbs up. Mazzone’s–Blue raspberry Italian Ice: This italian ice is SO COLD! It has a good flavor and it’s definitely not watered down. This is a thumbs up, especially in this weather. Noodle, The–Sesame beef on a stick. It’s a good-sized portion. The sesame flavor is good, but the beef is slightly tough and very chewy. Thumbs down. Good flavor but the texture is too tough and chewy. Now We’re Poppin’– Plain Popcorn: Truth to be told, it tastes stale. The popcorn is chewy and it’s sticking to my teeth. Thumbs down. Original Rainbow Cone–Rainbow cone: This portion is a ‘Taste’ staple. There’s real pistachio chunks, real strawberry pieces and palmer cherry pieces. This combination is beyond normal neopolitan. A thumb’s up! Polka Sausage & Deli– Pierogie: Lightly sweetened and could use some sour cream, but the cheese is nice and creamy. Good carmelization! Overall, I’d say a thumbs up. Polo Cafe– Garlic Mozzerella Cheese Bread: It has a nice layer of paprika on top giving it a great smoky flavor. It’s very buttery, very garlicy, and very good. Thumbs up. Reggio’s Pizza– Italian Ice: The little lemon on top is a nice touch. However, quite honestly, there is more ice than flavor. It’s not as good as the rasberry italian ice at Celebration’s. Ricobene’s–Italian breaded steak sandwich: The sandwich is a huge portion, but really good. The steak is sliced thin and breaded very nicely. I’m tempted not to talk, just so I can enjoy it! If I could, I wouldn’t be anywhere else than at this tent and my wife agrees whole-heartedly. Robinson’s #1 Ribs– BBQ Rib Tips: This was a HUGE portion of ribs. The sauce is sweet and the meat has a good, smoky flavor. I give it a thumbs up! Superossa– Thin crust sausage pizza: It had a good crust and good sausage, but the cheese ruined it. The cheese might have been made with low-fat milk. In my opinion, cheese is such an important part in a pizza. I’m going to have to give this one a thumbs down. Tiparos Thai Cuisine– Shrimp Fried Rice: It took too long too cook and they were took stingy on the portion size!! However, the scallions on top gave it a nice bite. Tuscany– Toasted Cheese Ravioli: It has a nice crisp coating. It’s fillied with riccota cheese with flakes of parsley and basil inside. Definitely one of my favorite tastes today! Tutto Italiano– Italian Fries: This portion resembles curly fries with lots of extra seasonings. It tastes very good. The seasoning includes arregano and romano cheese. It’s a thumbs up for sure! Vee-Vee’s African Cuisine– Jerk Chicken With Rice and Beans: The chicken is not anywhere near as spicy as jerken should be — not a good thing. The rice and beans are very dry. Not a winner. Vermilion Latin/Indian Cuisine– Mango cumin-dusted fries with chutney: It had a smoky flavor with a sweet sauce. It’s a nice twist on regular firies. A thumbs up! Vienna Beef/Gold Coast– 1/2 Hot Dog: It’s a nice steamed bun. The extra special touch is definitely the poppyseed encrusted. The only problem is that it has a pickle slice instead of a spear. Wow Bao– Chicken Teryaki Bao: I never had this before even though it’s a Michigan Ave. staple. The doughiness threw me off at first, but that’ s ok. The red pepper and green onions in there are a nice touch. It’s a nice portable way to eat. A definite winner! Well, my day is done here at the 2008 Taste of Chicago, and unfortunately my quest for 65 was not fullfilled. The heat and my ambitous time frame, eventually did me in. Delays by 2 of the first 3 vendors, long lines, and the humidity definately slowed me down. After the clouds rolled in I caught my second wind and started chugging along again, but once we got to 41(Lou Malnatti’s wasn’t blogged), we were already an hour into overtime, and we were all starting to feel it. While I didn’t taste all 65 booths, I feel that we were able to offer a fairly extensive guide to the Taste today, a guide that the crew and myself can be proud of. I want to thank the amazing crew that helped make this possible including Mr. Marcus Riley, Megan, Kay, Greg, Ryan, and my beautiful wife who played the role of photographer today. One last note, if you want to have a handy guide of all my eating to take with you, just click on my site and print it up or take a look at my next post. In an effort to make the guide more complete, I’ll include my opinions on some of the booths I missed this year, with my comments from 2007. The Taste of Chicago was born July 4th in 1980, and is now the second largest tourist attraction in Illinois. For ten days, this free- admission festival is the place to be, injecting the city with a spirit of hunger and attracting a few news stories along the way. To add some spectacle to all the gluttony, there will also be a performance by Cirque du Soleil as well as live concerts daily by artists such as Chaka Khan, Josh Kelley, and more. But when it comes to the food, how do you know what to try? With 65 different vendors serving well over 300 different food items, it’s easy to be intimidated. My friends, that’s where Hungry Z and my very large appetite come in. No need to walk around aimlessly and try random items you’re not sure you’ll enjoy. That’s my job. In an effort to create a comprehensive guide to the Taste, this Friday I will bring my large appetite to Grant Park, and sample something from all 65 vendors! My quest for 65 is one I fully intend to achieve. In an effort to resurrect my teenage appetite, I’ve been training! My regimen is as follows; I have hit the gym 12 out of the last 14 days, drinking a gallon of water each day, as well as eating 6 meals and 4 snacks each day. To document this I will be making an appearance on the NBC5 morning news this Friday at 5:45am, Tivo it if you can’ wake up that early. I’ll also be live on the 4:30 p.m. newscast.11 a.m. and will hopefully finish at 5 p.m. That means I have to try something new every 6 minutes. I’m going in order 1-65, so it’ll be real easy to track my progress. In addition there will be a live roaming Web camera Taste tracking my progress, which you can link to from this page, and I’ll also be doing a live blog right here so everyone can keep up with my opinions of each dish. 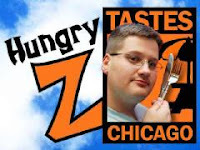 I’m starting my eating at 11 a.m. and hope to finish up at 5 p.m.
To help me truly “Taste Chicago”, I could use everyone’s help. Stop by the Taste this Friday and show your support. High fives and cheering will be much appreciated. And don’t think that you won’t be able to spot me, I’ll be the guy with a NBC t-shirt on and a camera following him. Thanks, and here’s hoping that I don’t puke! This week’s Word On The Street segment took us to the brand new Dana Spa and Hotel, a Chicago owned and operated facility located at 660 N. State St. The word “Dana” translates in Sanskrit to “the pleasure of giving,” which is what the operators of this swanky new establishment try to deliver. The hotel is set up to be a refuge from all the hustle and bustle from the busy downtown streets surrounding it. Along with the plush rooms, the spa offers a full range of treatments. The hotel restaurant, Ajasteak, is looking to put its stamp on the city’s culinary map. Think of it as a traditional steakhouse with an Asian twist. Make sure you check out their signature floating sushi bar, located on the first and second floors. Five movies, five nights, five after-parties. It can only mean the second annual Gen Art Chicago Film Festival. The festival kicks off Monday, with the opening night event being held at The Music Box, 3733 N Southport. Two of the stars of the opening night movie, Bart Got A Room, will be at the Opening Night event — Alisa Shawkat (star of the upcoming Arrested Development movie), and Steve Kaplan. A $75 pass gets you into all five nights of activities, including the after-parties. Check out an interview about the festival with one of the organizers. What more can you say about the Taste of Chicago? It’s one of Chicago’s most famous events, even though many locals turn up their nose at the over-the-top sweat-fest. But pick your spots and Taste can be a great time (like playing hooky from work and going during the day when it’s less-crowded). The music lineup is pretty stellar this year, with Stevie Wonder, Chaka Kahn, Joss Stone, Bonnie Raitt and more taking to the stage. Load up the kids — Taste kicks off on Friday.